Master roadmapping works by rolling up views from two or more source roadmaps into a single Master roadmap. To learn more about Master roadmaps, how they work, and why you need to create them, go to Master roadmapping in the Quick Guide. Like a regular roadmap, you create a Master roadmap from your Roadmap Home. 1. Click the NEW button at the top of the Roadmap Home navbar. 2. In the dropdown, click New Master. 3. 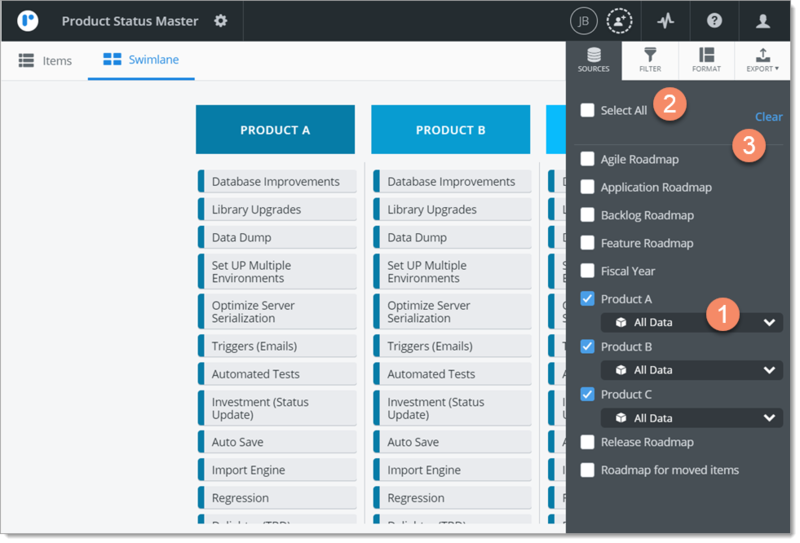 In the Create Master dialog, enter a name (Title) for the Master Roadmap (for example, Product Status Master). 4. Select the Master roadmap's Fiscal Year-End. TIP: For a Calendar year-end, select December 31st. For a Fiscal year-end select the corresponding end-of-month date. 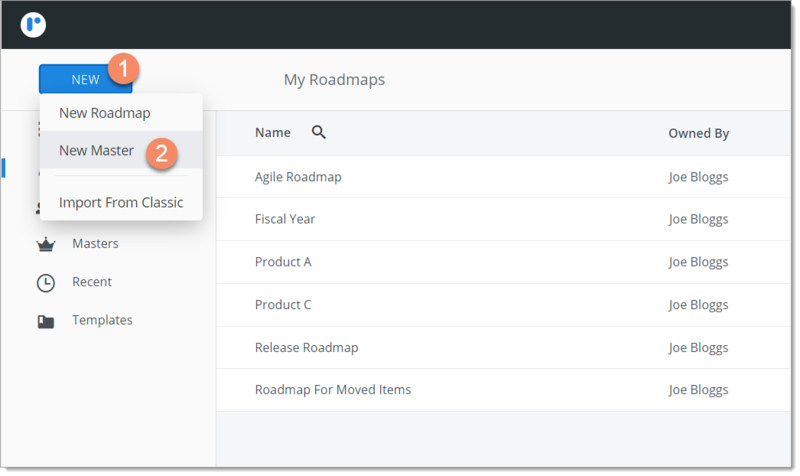 For more on roadmap year-ends and why they matter, see Create a new roadmap from scratch. 5. 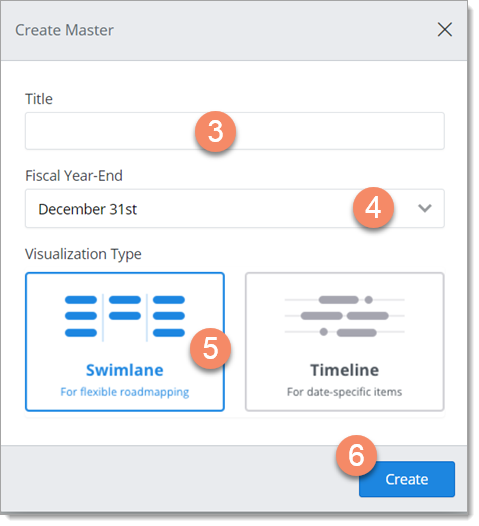 Select the Master roadmap's visualization type: Swimlane or Timeline. TIP: You can choose either visualization type for the Master regardless of the views you select as sources. For example, you can roll up Timeline views into a Master Swimlane or vice versa. The new Master roadmap is created and added to the list in your Roadmap Home Masters tab. Here's a snapshot of what your new Master roadmap might look like. You'll see that Master roadmaps have a Sources icon on the View navbar in addition to Filter, Format, and Export. The Sources panel is open by default and lists the roadmaps you're able to select as sources for the Master. NOTE: Only roadmaps that you own or have been shared with you as an Editor can be selected as sources (see Who can create Master roadmaps? at the end of the article). 1. 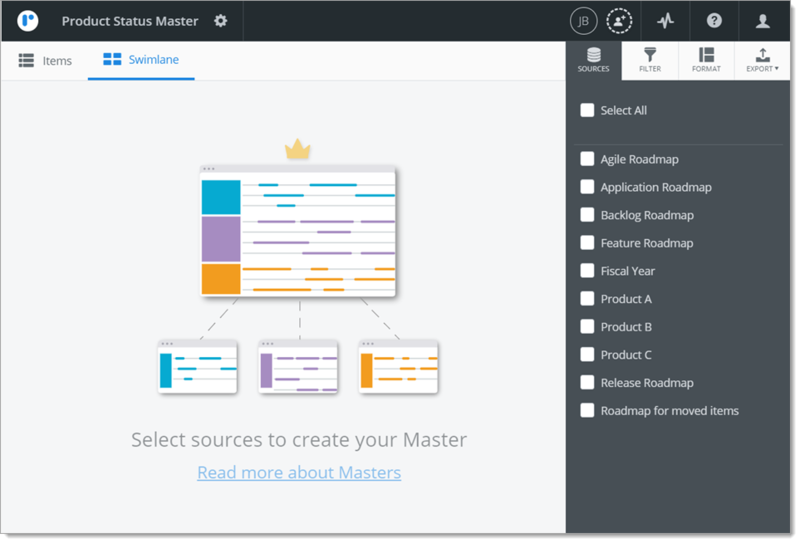 In the Sources panel, select two or more roadmaps that you want to roll up into the Master. 2. To select all the listed roadmaps, click Select All. 3. To clear your selection, click Clear. When you select a source roadmap in the Sources panel, a dropdown appears below with All Data selected by default. Leaving the selection as is will roll up all the items in the source roadmap into the Master. 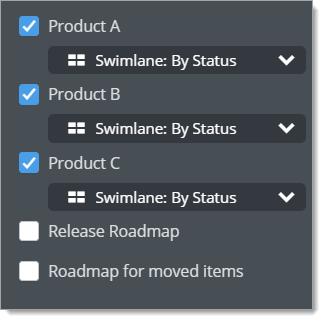 If you only want to roll up a subset of the items, select the roadmap view with the appropriate filters. 1. Click to open the roadmap's dropdown. 2. In the dropdown, select the roadmap view you want to roll up. 3. Select a view for each of the remaining source roadmaps, following the same steps. 4. Click the Sources icon to close the panel. Even if you've chosen to roll up views with a filtered data set, you can further filter items in a Master roadmap by applying filters the same way you do to regular roadmaps. For detailed help on applying filters, go to Filter items. Who can create and own Master roadmaps? To create a Master roadmap in Roadmunk you must be a Collaborator. Collaborator is one of the three user roles in Roadmunk. Every Master roadmap in Roadmunk has an Owner. The person who creates a roadmap automatically becomes its Owner. As a Master roadmap Owner, you have special permissions that no other user has. You can edit, rename, duplicate, and delete your Master roadmaps. You can share your Master roadmaps with other users and change sharing settings any time. Finally, you can reassign ownership of a Master roadmap to another Collaborator. Who can you share your Master roadmaps with? You can share a Master roadmap with both Collaborators and Reviewers, but only as Viewers. Viewers with a Collaborator role can duplicate a shared Master roadmap in addition to viewing it. Viewers with both Collaborator and Reviewer roles can export the Master roadmap view to a PNG or HTML file. For more help on user roles and permissions in Roadmunk, go to Sharing and collaboration in the Quick Guide.